Have you ever been in the middle of cooking and suddenly realize that you do not have any vegetable oil? If the answer is “yes” then thankfully there is a substitute for vegetable oil that you can use so that you do not have to rush out to the grocery store. In other words, you may have materials in your home that you can substitute for vegetable oil. Ultimately, the type of vegetable oil substitute used depends on the type of food being prepared. It is important to measure the substitute vegetable oil correctly or you may just end up with a cooking catastrophe. Once you fully understand how the vegetable oil substitute will taste and feel in your dish, you can use your creativity to prepare a delicious meal or dessert. In addition, with time and repetition, it will be common for you to use a vegetable oil substitute when cooking. This article will provide you with all of the information you need to incorporate a vegetable oil substitute into your daily diet. Selecting the best cooking oil can be quite challenging sometimes, especially with so many options in the grocery stores. When picking the right vegetable oil substitute for your dish, it is important not only to take into consideration the health benefits, but also the price, flavor, type of food and effect. Believe it or not, it makes a big difference whether you plan to fry, bake, grill or sauté the food, when choosing a cooking oil substitute. Dietitians and nutritionists often classify oils as either “good” or “bad” based on their effects on the heart. “Good” cooking oils tend to contain large amounts of mono- and polyunsaturated fats. These healthy fats help you absorb nutrients from the foods you consume. “Bad” cooking oils, on the other hand, tend to contain large amounts of trans- and saturate fats. These unhealthy fats can elevate your low-density lipoprotein (LDL) cholesterol (bad cholesterol) levels. You should reduce the following cooking oils (coconut oil, palm oil, palm kernel oil, and vegetable shortening) because they are high in calories and rich in saturated fat and hydrogenated oil. The best alternative cooking oils are: olive oil, applesauce, bananas, yogurt and canola oil. Although vegetable oil can be consumed in moderation, if possible it is best to use a vegetable oil substitute when cooking. Replacing vegetable oil with a substitute for vegetable oil not only provides you with a wealth of nutrients, it also prevents a long list of medical conditions and diseases. Next time you are shopping for cooking oils, consider purchasing a vegetable oil substitute. Do not be afraid to try a substitute for vegetable oil, it may just improve the quality of your life. Unsweetened, all-natural applesauce and mashed ripe bananas can be used as a substitute for vegetable oil in baking. These soft fruits are high in vitamins and low in calories and fat, which makes this substitute for vegetable oil highly beneficial for a variety of people. Vegetable Oil Substitute Effect: These fruits are especially beneficial for those who are on restricted diets and/or those who have allergies. In addition, this vegetable oil substitute is lower in fat and calories than other cooking oils. Best Use: This vegetable oil substitute is best used for baking. It is best known for adding moisture to baked goods like cookies, cakes, muffins and breads. Plain or vanilla low-fat yogurt is another good substitute for vegetable oil in baking. This healthy substitute for vegetable oil is rich in fatty lipids, hormones that regulate your metabolism. If you decide to use this alternative, reduce the other liquids in your baked good because yogurt adds water. Taste: It is important to reduce the amount of milk and/or water required for your dish because the yogurt will add water to it. Your baked good will have a slightly tangy taste to it. Best Use: This substitute for vegetable oil is best used for baking. In fact, plain or vanilla low-fat yogurt is perfect for making low-fat cranberry, blueberry and/or banana nut breads. Olive oil is also a useful substitute for vegetable oil. This vegetable oil alternative is not only aromatic, but also rich in antioxidants and monounsaturated fat, which can lower your risk of heart attacks, strokes, blocked arteries and heart disease. Taste: Extra virgin olive oil has the mildest flavor of all of the olive oil options. Make sure that you use chose only the highest quality of extra virgin oil from a reputable brand because the flavor can differ from product to product. Best Use: This substitute for vegetable oil should not be used for frying because it does not have the boiling or smoking point (400° F/204° C) needed to effectively deep-fry foods like French fries or hot wings. This vegetable oil substitute is best used for baking breads and preparing pastas, sauces, marinades and salad dressings. Another beneficial substitute for vegetable oil is coconut oil. Coconut oil is rich in nutrients like vitamins, minerals and fiber. This vegetable oil substitute not only helps strengthen your immune system, it also helps regulate your blood sugar, balance your hormones, aid in weight loss and reduce your LDL cholesterol level. Vegetable Oil Substitute Effect: If you decide to use coconut oil as a substitute for vegetable oil make sure that all of the other ingredients in the dish are room temperature. Coconut oil tends to solidify and harden when it comes into contact with cold materials. In addition, use a large, wooden spoon when heating and stirring coconut oil as to avoid getting burned. Best Use: This substitute for vegetable oil is best used in baked goods, but it can also be used in smoothies, drinks and salad dressings. Considerations: It is important to remember that while coconut oil is cholesterol-free, it still contains a large quantity of saturated fats, which can be detrimental to your health and/or weight loss goals. 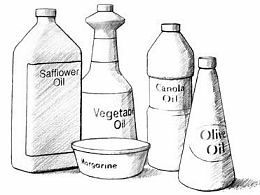 If possible switch to a substitute for vegetable oil that is rich in healthy unsaturated fats like olive and/or canola oil. Lard and vegetable shortening both make a great substitution for vegetable oil. These alternatives are best known for adding a robust flavor to fried foods and making crusts flaky. Although lard and vegetable shortening are flavorful additions to fried foods, the CDC and USDA, advise against using these vegetable oil alternatives because they are high in saturated fat, which can contribute to obesity and high blood pressure. Taste: There is no noticeable difference in taste. Best Use: This substitute for vegetable oil is best used for frying (French fries, hamburgers, fried chicken). Considerations: Avoid using one of these food products as a vegetable oil substitute, for baking, because lard and shortening cannot replace vegetable oil in a recipe. They are considered solid fats, while vegetable oil is considered a liquid fat; therefore replacing one for the other will alter the taste and texture of your dish. Butter is also a useful substitute for vegetable oil. In fact, butter is most like vegetable oil when cooking a variety of foods. Butter, when heated, provides a fatty lipid composition that is similar to the fatty lipid composition of vegetable oils. Taste: Butter gives your dish a rich, warm flavor. If you decide to use salted butter make sure you correctly adjust the amount of salt you add to your dish. Best Use: This substitute for vegetable oil is best used for baking (cookies, brownies, cakes, breads and cornbread) and frying (French fries, chicken, etc.). Canola oil is considered a healthy substitute for vegetable oil because it lacks corn and soy, two food products that can cause allergies for many people. It is also rich in unsaturated fats and fatty acids like (omega-3 and omega-6). This vegetable oil substitute not only helps reduce your LDL cholesterol, it also aids in blood clot formation, therefore reducing your risk of a heart attack and/or stroke. Vegetable Oil Substitute: Canola oil can go rancid fairly easily so if you decide to use it in your baked goods it is important that you refrigerate your dish immediately as to avoid spoiling and molding. Taste: Canola oil can give fried foods a fishy taste, but there is no difference in taste or texture in baked goods. Best Use: This substitute for vegetable oil is best used in baked goods like cakes, cupcakes, breads. A vegetable oil substitute that is sometimes used when cooking is palm oil. Palm oil accounts for approximately 30 percent of the world’s fats and oil supply. This type of oil is not only rich in unsaturated fats, but also in vitamin A and E. It is important to note that the USDA warns against using palm oil (an especially palm kernel oil) for cooking because it can significant increase your LDL cholesterol levels and risk of heart attacks, strokes and/or heart disease. Taste: This alternative provides a strong, sweet taste to your dishes. Best Use: This substitute for vegetable oil is best used for frying, but it can also be used to make cakes, donuts, candies, cookies, pastries, biscuits and sauces.